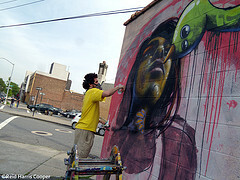 On Friday, May 21st I got myself a preview of the Welling Court Mural Project. 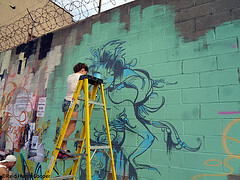 Welling Court is a physical block in Astoria, Queens… the actual mural project encompasses sections of the wall covering Welling, 30th and Main. I met up with my buddy Matt and was pleased to see Alice out there as well, also Cern was working and Lady Pink, Cycle, Sofia Maldonado, Celso, Pablo Powers, Cey, Mr. Keijii and a few others were getting their work done. The next day Matt picked me up so we could head over to Welling to finish up and take in the party. He brought his kids with him which was a nice and enjoyable surprise and made the day so much better. 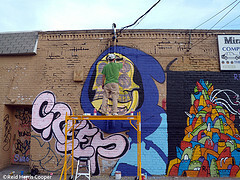 Folks like Tristan Eaton, Michael DeFeo, VENG, and Stormie Mills were out working along with the crew from yesterday. Lots of energy and amazing art was happening. The whole thing ended up with a huge block party with food and dancing and music. By 9 o’clock I was beat, Matt was beat, the kids were out…so it was time to call an end to everything… but boy was it fun while it lasted. For my own memories I wanna send magical love out to Alison & Garrison and Bogart. Without them, none of it would be possible and an amazing amount of love to the entire community of Welling Court/surrounding area.